BB-8: Return of the Droids! I haven’t drawn a particularly complicated thing in a while… and while I keep meaning to draw a C-3P0 to go along with my R2-D2 illustration from last December, I at least was inspired again to draw a Star Wars droid! This time, I hunkered down and rendered BB-8, from the most recent Star Wars, The Force Awakens. There is an elegant simplicity in this particular droid and the primarily spherical design. It doesn’t have nearly the detail of some other characters, but it has just enough to make it interesting. I also like that it’s basically a two-color character (white and orange) with just a little bit of silver and a couple of red and blue splashes for effect. While this actually only took me a few hours to complete, I made the classic mistake of deciding to start drawing it about 2 am the other day… so I ended up staying awake all night and finishing it before going to bed the next morning. I need to work on drawing at normal hours, but sometimes when an idea and motivation strikes I have to grab hold and take it where it leads me so I don’t lose it! Different from some of my other illustrations of this type, I added a couple of shadows. 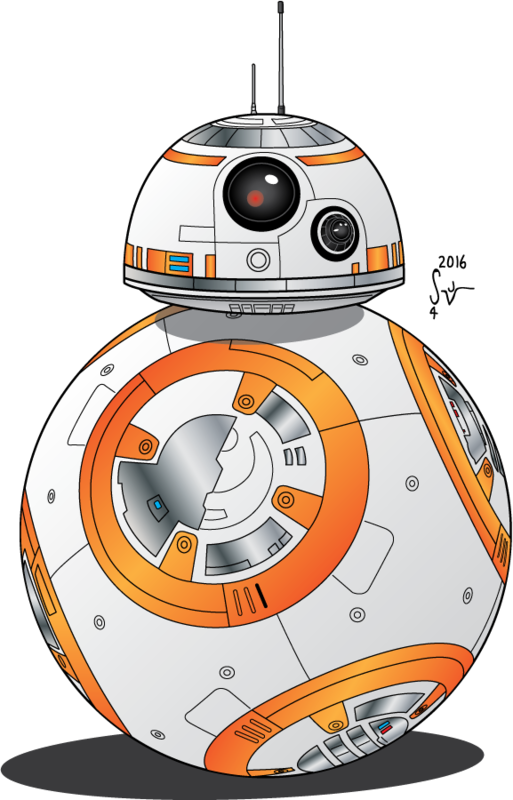 For some reason, BB-8 just didn’t look right without shadowing under the head and on the floor. As I was finishing things up, I became aware that this is not to the same scale as my previous R2-D2 illustration. If I ever decide to composite these for something in the future, I’ll have to address that… maybe whenever I get around to C-3P0? As always, please let me know what you think… and remember, if you’d like an original commission by me or would like to hire me as an Illustrator, please use the Contact page and let me know as much as you can about your request. Obviously, or perhaps if I did things right not so obviously, this was not the original Sunday plan. It was definitely going to continue from last Sunday and the Bill & Ted part remained the same… but when I was younger, I used to like to have conversations with people using only familiar song lyrics. It’s amazing sometimes how much of an actual conversation you can have with someone if you have the same taste in music. So, anyway, with Prince still floating in my brain I reworked today’s episode to incorporate as many lyrics as I could while still hopefully telling the story I wanted to tell. Oh, and I won’t forget about that little nugget dropped in the first story panel (after the movie poster homage) by Buzz… it means something. 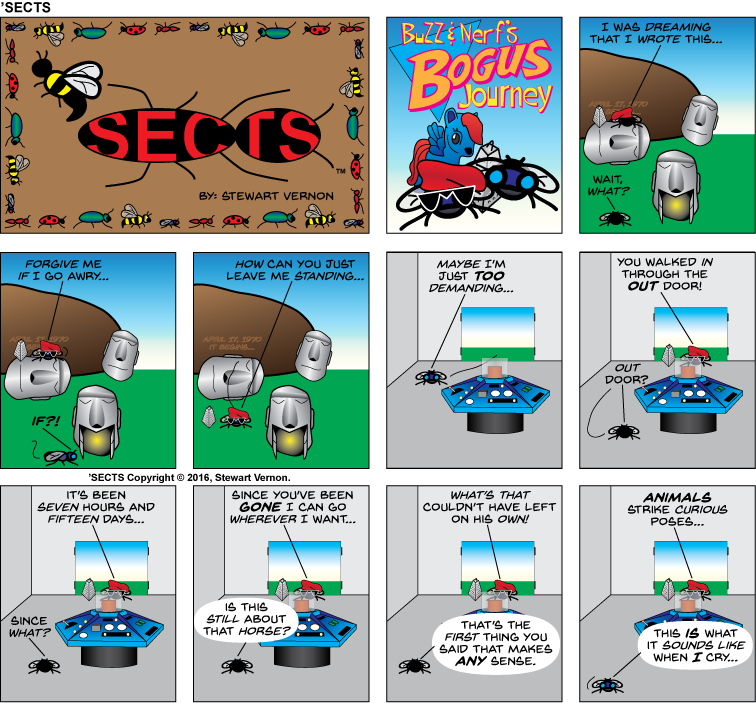 I’m not really prepared or properly equipped in my silly little comic strip here to make proper tributes when someone of significance passes away. I feel it’s appropriate personally since I was a big Prince fan in the 1990s and have a soft spot for a lot of his music and many lyrics are still stuck in my head today… but I do wish I weren’t doing what seems like so many of these this year.